The impact of Super Storm Sandy cannot be overstated. Thousands of homes were destroyed and hundreds of lives lost in what has been reported to be the second costliest storm in American history. Post-Sandy recovery efforts are still underway across the state and many residents have discovered that changes in flood insurance maps are forcing them to have their homes elevated or pay heavy fines. If you are one of the thousands of New Jersey residents who need to have their home raised above the new flood levels, you probably have some questions about the process. For that reason, we here at Penn Jersey Development Co. have developed this step by step guide to the New Jersey home elevation process to help shed some light on the issue. Home Elevation in New Jersey is a matter of hazard mitigation. That is to say, raising your home is all about reducing the risk of damage from future storms. After Hurricane Sandy, FEMA redrew the flood plain maps and raised the flood levels in many parts of New Jersey. These changes have made it so that residents within these zones are required to raise their homes above the flood levels or suffer penalties on their insurance. Check the new maps to see if raising your home is required. The flood maps can be viewed on FEMA’s website. The next step in the New Jersey home elevation process is the survey, or field visit. Once you decide to move forward with the home elevation process, a home elevation specialist will have to come out and survey your property. This step allows the home elevation contractor to develop a ‘game plan’ for your home lift while also taking stock of any issues that may arise during the lift. Next, the home elevation team will disconnect all utilities going into the house. This includes shutting off and disconnecting electricity and cable lines, capping all sewage and well-water pipes, and tuning off any natural gas hook-ups. The next step in the New Jersey home elevation process is to excavate the land around the house. The existing foundation must be dug out to make ready for the lift. Excavation channels will be dug out around the foundation to allow for the insertion of steel supports, cribbing, and hydraulic jacks. 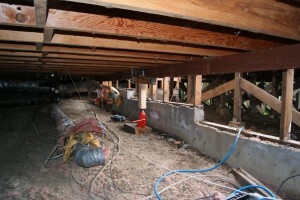 Once the property has been excavated, steel supports are inserted along the bottom of the property, in both directions. 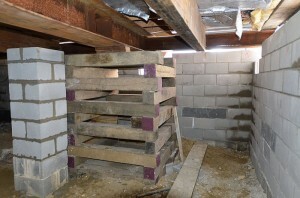 These steel supports create a ‘base’ for the home to rest on during the lift. 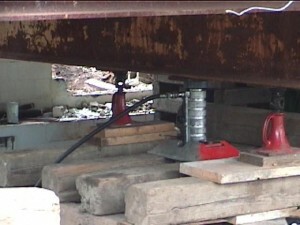 Hydraulic Jacks are placed on the ground below the steel supports. These incredibly powerful jacks are the mechanism by which the house is physically lifted. Depending on the size of your home, anywhere from four to twelve jacks may be needed. The jacks raise the house slowly, only a few inches at a time, to ensure that the home is being lifted in a level and safe manner. Wooden cribbing is placed beneath the steel supports between the home and the newly excavated ground. This works to help support the home during the home elevation process. With every few inches the home is lifted, more cribbing is added to support the lift, all the way up to the desired height. With most homes, the existing footing and foundation from the original structure can be reused once the lift is complete, but for some New Jersey home elevation projects, new footing and foundations must be poured. It is during this phase that those foundations are laid. New Jersey home elevation projects are supported on one of two elevated platforms; raised foundations or pilings. Whether you choose to go with a solid concrete foundation or wooden pilings, it is in this stage of the home elevation process that this elevated platform will be built/installed. Once the elevated platform is completed, the home is lowered onto it. The jacks, steel supports, and cribbing are removed and the home is seated to its new foundation. Utility lines and reattached and the excavated property is filled in. If your home resides within the newly drawn flood-zones, or if you’re just looking for a way to weather the next storm, turn to your friends at Penn Jersey Development company. Our New Jersey home elevation experts have over 25 years of experience and the know-how to get the job done right the first time.